The IMSeco “Selective Catalytic Reduction (SCR) Technology” is designed bespoke for each application and can be retrofitted to existing Power Generation Equipment for compliance with the Medium Combustion Plant Directive (MCPD). The SCR system will reduce NOx emissions by approximately -95% taking it well below the threshold of 190 mg/Nm3 @15% O2 set by DEFRA on Diesel Powered engines within the specified 10-20 minutes from start-up. Retrofitting with the IMSeco SCR Technology enables customers with agreements in the UK Demand Side Response (DSR) Capacity Market comply with both Tranche A and Tranche B requirements. 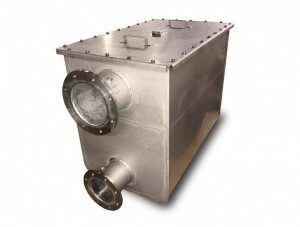 The SCR Catalysts are housed in a full Stainless-Steel Modular Reactor for either “SCR only” or SCRT (SCR plus DPF) configurations where the reactor is sectioned into two chambers, the lower chamber having an “In-built AdBlue Mixer Pipe” prior to either the DPF or SCR substrates and the Upper Chamber housing the SCR Catalysts. The Inlet and Outlet Exhaust Pipework can be located on either side of the reactor. A removable lid is provided for access to remove the substrates for maintenance if required. The modular SCR system can be scaled up to suit much larger “Stationary Power” or “Marine Application Engines” as shown in the diagram below. The IMSeco SCR Technology is capable of achieving up to -98% NOx reductions. The engine speed and load are used to calculate the exhaust flow across the catalysts to determine the exact rate at which to inject the “AdBlue” agent. AdBlue is a liquid reductant which consists of approximately 68% water and 32% Urea. IMSeco provides a small integral “AdBlue Tank” with level sensors and a control panel that controls the amount of AdBlue that is dosed via the “AdBlue Pump” and the “Airless AdBlue Injector”. Once injected into the exhaust stream the water content of the AdBlue will evaporate, and the urea will decompose into an ammonia gas at temperatures above 180C. A temperature sensor is used at the point of injection to ensure that there is sufficient temperature for injection to take place to prevent the Liquid Urea crystallising and potentially blocking the face of the SCR. Once converted into an ammonia gas and passed across the SCR Catalyst a chemical reaction takes place that converts NOx (NO + NO2) into nitrogen (N2) and water vapour, natural components of the air we breathe, which is then expelled through the exhaust outlet. 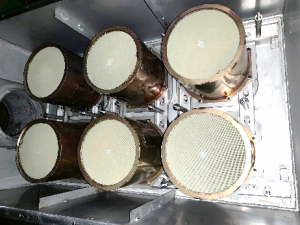 NOx sensors are used to measure the “Engine Out” and “Tailpipe” NOx to validate NOx reductions that are taking place across the SCR Catalysts. An ammonia slip catalyst is also used after the SCR Catalysts to prevent any ammonia gas being emitted from the tailpipe in the unlikely event that there is an overdosing of the AdBlue. The ECU is fitted with a memory chip which stores “Real-Time” NOx emissions data can be downloaded via the Windows Friendly Software to enable reporting of reductions being achieved. Downloads can be done manually via a laptop or through a Telematics Package. 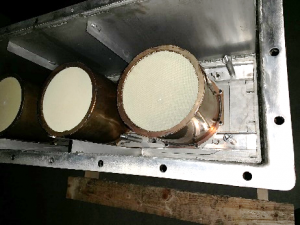 The IMSeco SCR System when retrofitted to an older Stage II/IIIA engine is capable of bringing the emissions below the threshold limit of 190mg/Nm3 NOx set by DEFRA for compliance with the MCPD (Medium Combustion Plant Directive). By adding the DPF Technology as well as SCR, a Stage II/IIIA engine can be potentially brought to the latest Stage V emissions equivalence for Mobile Generators. 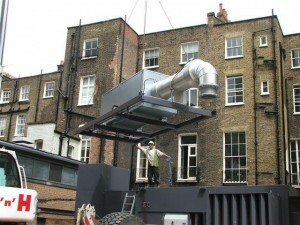 The MCPD was transposed into UK Law in December 2017 setting emission limits for Power Generation Equipment with engines with a thermal rating of between 1 and 50MW that ‘combust’ or burn fuel (such as diesel or gas) in order to produce power. The directive sets limits for NOx (NO/NO2) of 190mg of NOx / Nm3 (at 15% O2) and 120mg/NM3 for Sulphur Dioxides (SO2). The limits are to be achieved within 20 minutes of start-up for Tranche A applications and within 10 minutes for Tranche B. Operators must obtain an environmental permit to operate plant. Monitoring of the MCPD is the responsibility of the Environmental Agency. Fill out a few details and we will get back to you. 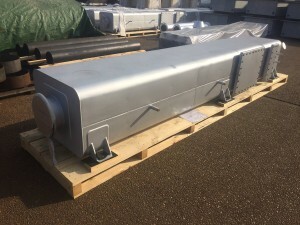 Industrial & Marine Silencers Ltd.
© 2019 Industrial & Marine Silencers Ltd. Company No: 02605553. Web Design by Splendid Apple.